MS Excel is designed to work with spreadsheets. This app is very useful for various types of calculations by using built-in functions and formulas. In addition to basic calculations of addition, division, multiplication and subtraction, the program is able to do the calculation using financial and logical functions. 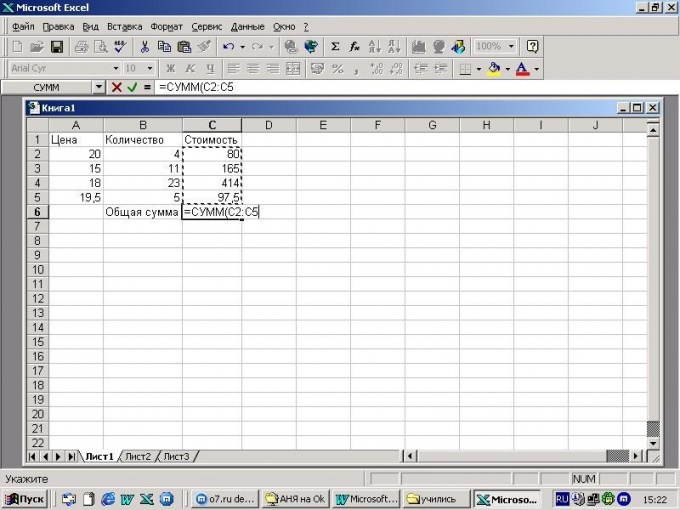 Start the MS Excel program to perform the summation of the cells. Set of cells in which you enter numbers, the numeric or currency format. To do this, select the range of cells, click the right mouse button and select "Format cells". Either select menu "Format" and "Cells". Go to the tab "Number" and select the format cell. Install the required number of decimal places and click OK. Enter the desired data in cells to determine the sum of the numbers in Excel. To enter the same or increasing by an order of magnitude (e.g., 10, 12, 14) use the "AutoFill". If you want to calculate the sum of cells in a single column or row, and display the result in the last cell, highlight the data column and click "AutoSum" in the toolbar. Calculate the sum of values in the Excel cells with the help "Master of functions". To do this, select the cell where you want to get the result, type the Equal sign. Click the "function Wizard" on the toolbar. From the list of options, select "Amount" or Sum. In the opened window click on the button to the right of the field "Number" and select the range of cells or type it in this box and click "OK". The range is entered in the following format: for example, to determine the sum of cells A1 through A19, enter them separated by a colon. To sum two ranges, take them to the brackets and between them put a sign "Plus". Click "OK". You can add the function manually, to do this in the right cell, type the Equal sign, write the Sum or "Sums", depending on the version of the program. Then, select the range of cells and click Enter. Calculate the amount of cells that if the numbers are in different places of the table and cannot be combined in one range. In the cell where you want to get the result, type the Equal sign. Next, select the first cell to enter a link to it in a formula, put the Plus sign, select the next cell, again. Consistently highlight the required cells and click Enter.